Whether this is your first time creating a campaign, or you’re just looking for a refresher, we hope you’ll find this guide helpful. Step 1. Give us a bit of information about your campaign. 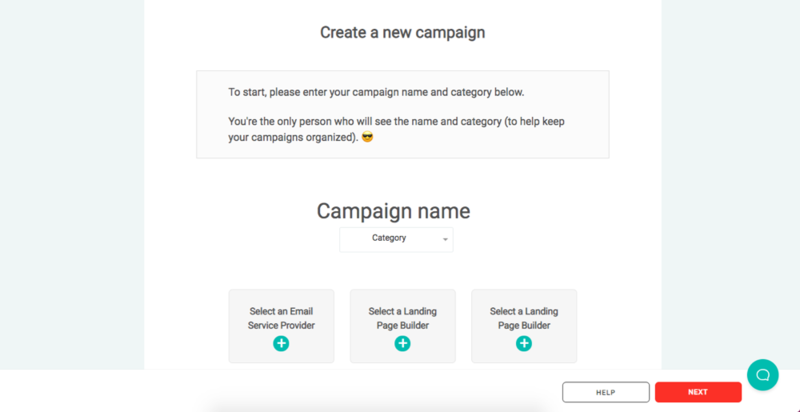 First things first - You'll need to give your campaign a name and select or create a category for it to fit under (the category is for your organization within the admin). Next you'll select your Email Provider and Landing Page Builder(s). You have the option to choose up to two Landing Page Builders. Once you've done that, you can hit Next. Step 2. 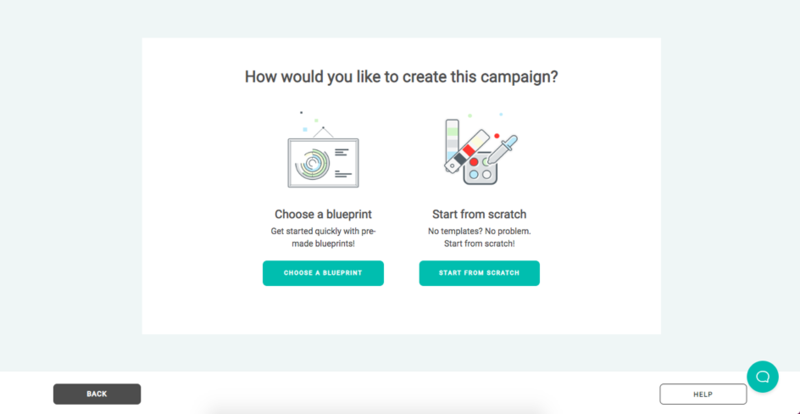 Decide how you would like to create your campaign. 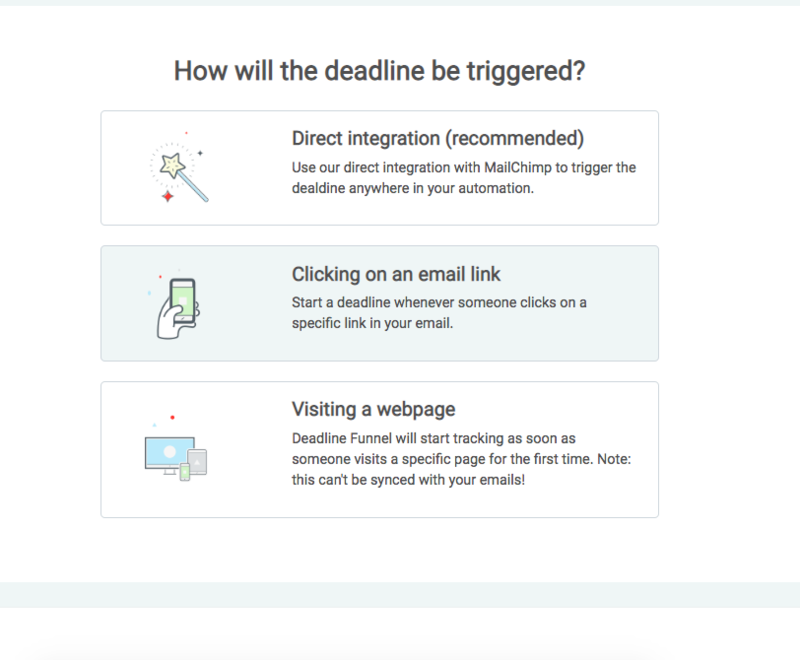 Email sequence + special offer: Set up an automated email sequence that presents each of your subscribers with a unique deadline. 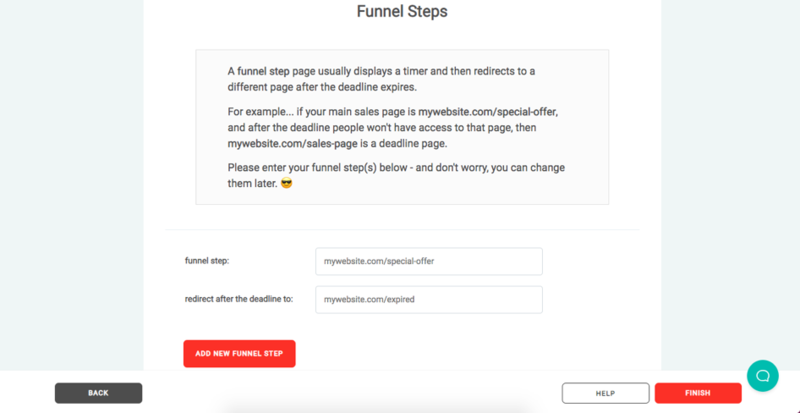 Automated webinar: Build an automated webinar funnel with a special offer and deadline for each webinar attendee. 15-minute optin upsell: Create a short upsell offer that's presented after someone opts into your email list. 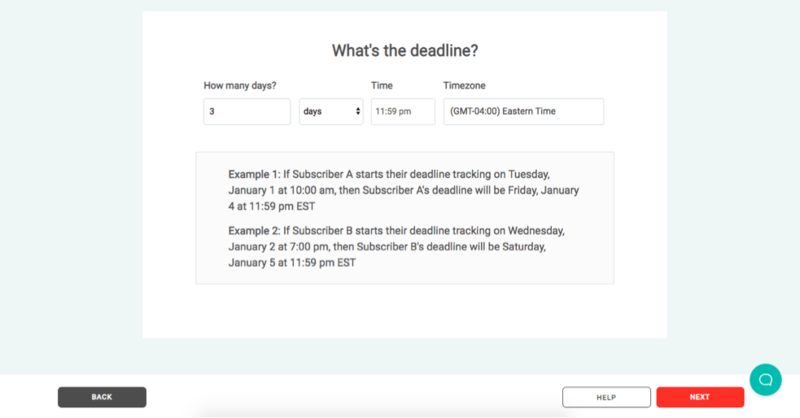 Click-based sequence: Only show a deadline to subscribers who express their interest in your offer. 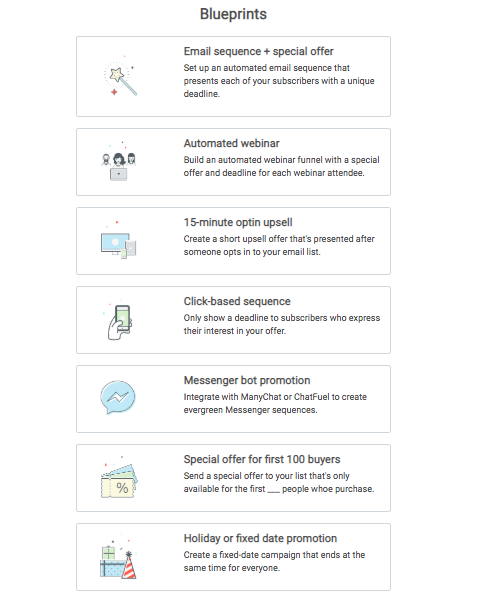 Messenger bot promotion: Integrate with ManyChat or ChatFuel to create evergreen Messenger sequences. Special offer for first 100 buyers: Send a special offer to your list that's only available for the first ___ people who purchase. Holiday or fixed-date promotion: Create a fixed-date campaign that ends at the same time for everyone. Please refer to our guide on How to Choose a Campaign Type. Check out our guide on how to select a trigger here. Step 3. Select your deadline. Step 4. Add your Funnel Steps. Hit ‘Finish’ at the bottom and you’re all set! 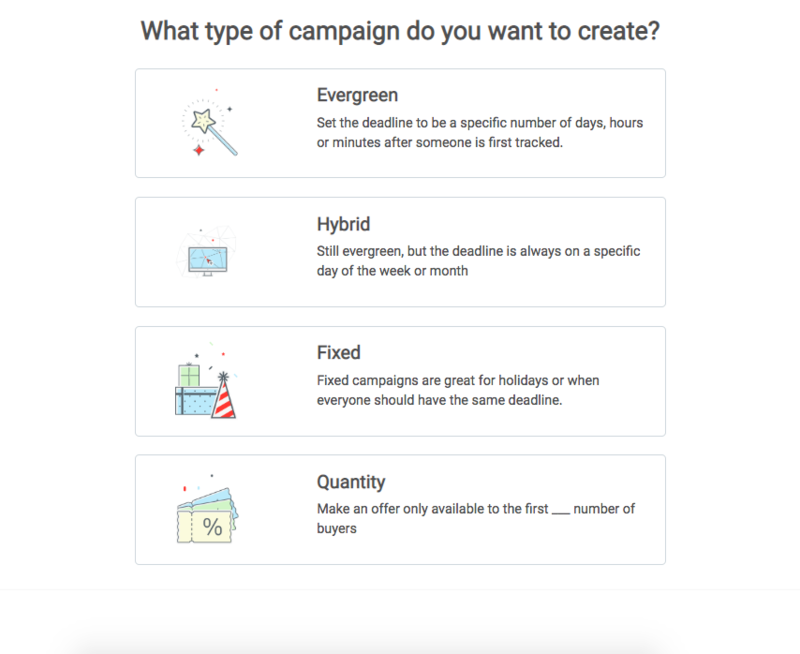 Your new campaign is ready to be integrated with your sales funnel. If you’re not sure what to do next, check out our Getting Started guide. As always, if you have any questions, please reach out to us via live chat in the bottom right hand corner or shoot us an email at help@deadlinefunnel.com.